A new real-time video of Philae’s descent shows it took the probe longer to drift from Rosetta down to the surface of Comet 67P/Churyumov-Gerasimenko than it would’ve taken you to walk the same distance. We knew the tiny lander Philae was incredibly gentle during its historic descent to Comet 67P/Churyumov-Gerasimenko, but we didn’t really understand how slow that was until now. 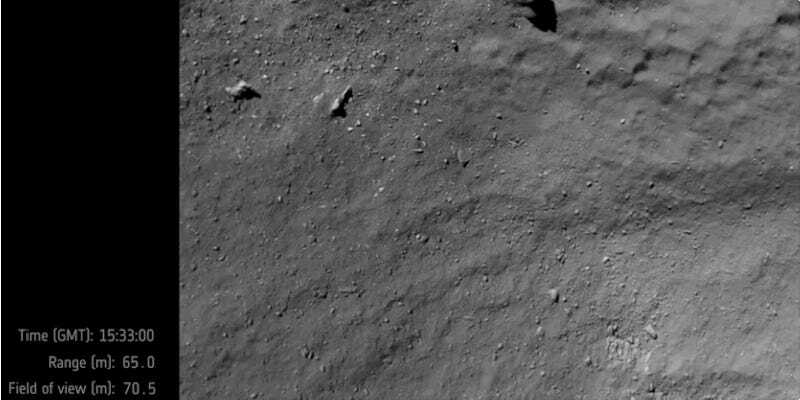 The lander descended at roughly a meter a second, or walking pace, on its historic arrival to the comet on November 12, 2014. It took a photograph every ten seconds from 67 meters to just 9 meters above the surface. It hit the comet’s surface less than 10 seconds after capturing the seventh image, touching down at Agilkia before bouncing and coming to a rest at Abydos. Philae isn’t equipped to take real-time video, and it would take far too long to transmit that kind of data home, but this interpolation is the next-best thing. The film was created by Platige Image under the supervision of Jakub Knapik. He used the visual effects compositing software NUKE to create a 3D projection of the comet from the seven images, infilling any data drop-outs and masking out pieces of Philae sneaking into frame. He then loaded in the probe’s flight path data to create a realtime landing sequence from the Philae’s perspective. The soundtrack is the instrumental version of “Saline” by Jem Godfrey of Frost*. The video uses the same raw data as the seven ROLIS images released over the summer, but this is far more beautiful and viscerally moving. Knapik previously worked on ESA’s scifi short “Ambition.” The Philae probe briefly woke up before power issues and unfriendly geometry ended communication. It will try to get back in touch later this fall. The Rosetta spacecraft is still in orbit, and recently uncovered evidence of a water cycle on the comet.